An Information system is a set of people, procedures, and resources that collects, transforms, and disseminates information in an organization. Today’s end users rely on many types of Information Systems (IS). Some are simple manual information systems, where people use tools such as pencils and paper, or machines such as calculators and typewriters. Others are computer-based information systems. Computer-based information systems mean the use hardware, software, telecommunications, and other forms of Information Technology (IT) to transform data resources into a variety of information products. Four kinds of organizational changes are enabled by Information systems. 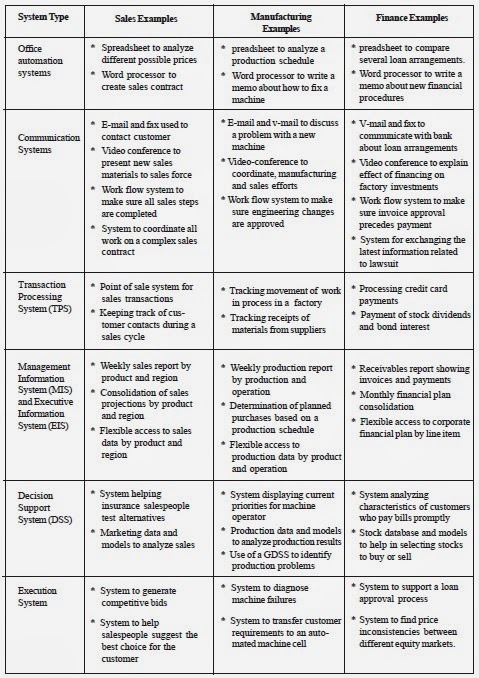 These are automation, rationalization, re-engineering, and paradigm shift. When an organization does not use its internal resources to build and operate information system it takes help of other organizations to provide these services. This is called outsourcing. There are advantages and disadvantages of using outsourcing. Quality programs differ greatly from company to company. Some are merely generalized “sales” campaigns intended to sensitize employees to the need to strive for more quality in their daily work. At the opposite extreme, quality programs can result in fundamental changes in the way a company does its business. Companies also follow different routes in achieving quality. Whatever route a company selects, the more it tries to achieve with its quality programs, the more information systems can contribute the success of those programs. 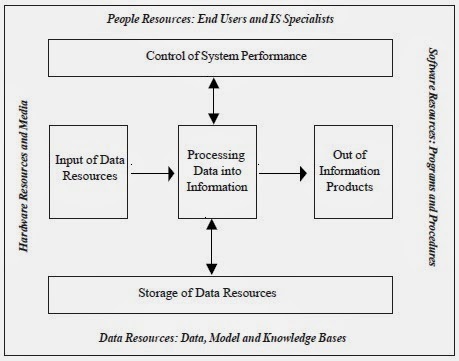 A computer based information system uses the resources of people (end users and IS specialists), hardware (machines and media), and software (programs and procedures), to perform input, processing, output, storage, and control activities that convert data resources into information products as shown in Figure-1. Before going into the details of Computer based Information System. Let us first discuss about a system. A system is a group of interrelated components working together toward a common goal by accepting inputs and producing outputs through an organized transformation process. · Input involves capturing and assembling elements that enter the system to be processed. For example, raw materials, energy, data, and human effort must be secured and organized for processing. · Processing involves transformation processes that convert input into output. Examples are a manufacturing process or mathematical calculations. · Output involves transferring elements that have been produced by a transformation process to their ultimate destination. For example, finished products, human services, and management information must be transmitted to their human users. The systems concept can be made even more useful by including two additional components: feedback and control. A system with feedback and control components is sometimes called a cybernetic system, that is, a self-monitoring, self-regulating system. · Feedback is data about the performance of a system. For example, data about sales performance is feedback to a sales manager. · Control involves monitoring and evaluating feedback to determine whether a system is moving toward the achievement of its goal. The control function then makes necessary adjustments to a system’s input and processing components to ensure that it produces proper output. For example, a sales manager exercises control when he or she reassigns salespersons to new territories after evaluating feedback about their sales performance. · People, hardware, software, and data are the four basic resources of information systems. · People resources include end users and IS specialists, hardware resources consist of machines and media, software resources include both programs and procedures, and data resources can include data, model, and knowledge bases. · Data resources are transformed by information processing activities into a variety of information products for end users. · Information processing consists of input, processing, output, storage, and control activities. Basic IS model shown in the given in Table-1. 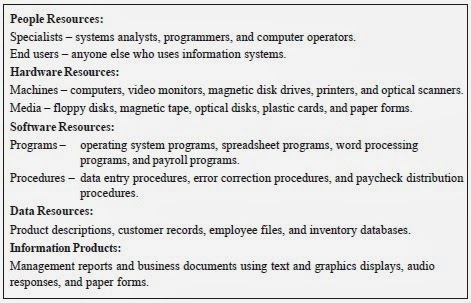 The table indicates that a computer based information system consists of four major resources: people, hardware, software, and data. There are many kinds of information systems in the real world. All of them use hardware, software, and people resources to transform data resources into information products. It is important not to confuse information systems with the concept of computer systems. A computer system is a group of interconnected hardware components that may take the form of a microcomputer, minicomputer, or large mainframe computer system. However, whether it sits on a desk or is one of many computers in a telecommunications network, a computer system still represents only the hardware resources component of a computer-based information system. As we have just seen, an information system also consists of people, software, and data resources. One of the reasons the various categories are mentioned frequently is that each is used in every functional area of business.